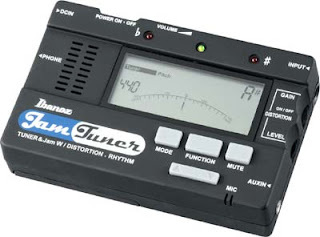 If I had to design a guitar practice tool for myself then it would most definitely be a lot like the RU10 Jam Tuner. In one package small enough to fit in a guitar case you get a chromatic tuner, metronome, rhythm machine and mini-amp with guitar and line input for your backing tracks. It's ideal for those short practice sessions when you want to get started fast. The chromatic tuner displays a tuning needle and also has LEDs you can use in low light conditions. It captures your instrument through either a jack connector or a built-in mic for acoustic guitars. The metronome can play varied time signatures and is controlled easily with a simple up-down button to select the tempo. As well as the metronome you can also select from 20 preset rhythm patterns using realistic drum sounds. The mini-amp is a feature that should be especially appreciated by electric guitarists. It provides gain and distortion controls for your guitar so you can jam along to the rhythms without a separate amp. One minor point here - you can't get a clean electric sound, only varying levels of distortion. Update: I later learned that the distortion level control also serves to turn off distortion with a click over at the end of its range to get a clean guitar sound. Finally, you can also plug-in an external audio source, so you can jam along to your favourite tracks from your portable music player. The Ibanez RU10 is a very well thought out practice tool. It has everything you need to get in tune, practice in time, and even jam along to your favourite audio tracks. I know of no other product offering all these features in a single device, it is a complete solution for portable practice of acoustic or electric guitar. Similar products: Boss Dr. Beat Metronome , Vox Amp Plug . Can't get a clean sound? According to the manual: Use the GAIN control to adjust the amount of distortion. By turning clockwise all the way till it clicks, you will be able to turn off the built-in distortion effect. Gary, did you try this? Hi, thanks for the tip. I did eventually discover this, just shows you it's worth reading manuals sometimes. Hi Hanika - The RU 10 should work fine with a bass. The sound might not be that great, but that's what you might expect from a headphone practice amp. Another option to consider is the Vox AmPlug. They have a version designed for bass guitar. It has a jack input so you could plug in a metronome. The guitar AmPlug has a nice sound.